Testing Garage: Bugs with new Yahoo! Mail version? or Bugs with Mozilla Firefox browser? Bugs with new Yahoo! Mail version? or Bugs with Mozilla Firefox browser? 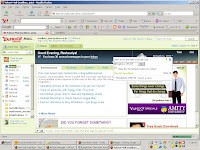 It was nice to find some bugs, but not sure whether those are from Mozilla Firefox browser or of new Yahoo! Mail version. With the Firefox browser installed of version 2.0.0.14, logging into Yahoo! Mail Classic, upgraded it to the new Yahoo! Mail (beta version). Clicked on drop down arrow button, near the city name for which the temperature was being displayed. An edit box for entering the city name or postal zip code was displayed along with the ‘Go’ button. Again repeated the same process i.e., from clicking on drop down arrow, till entering the zip code of a city. This time entered the name of the city. Again repeated the process and entered a zip code of a city. The locations that were browsed recently were displayed under the Recent Locations frame, where “Delete All” was also displayed. Clicked on the “Delete All” phrase. Noticed the strange thing. The frame was retained as it is, but it was transparent after clicking on “Delete All”. 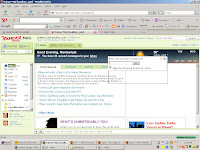 Scrolling the vertical scroll bar of the Mozilla Firefox browser, took off the displayed transparent layout. This is reproducible very easily on Mozilla Firefox with new Yahoo! Mail version. With Mozilla Firefox and new Yahoo! Mail version (after login). Clicking in the mouse at the edit box, the cursor was displayed. Selected the displayed city name in the edit box and deleted it. Still the cursor was displayed. Any opened window gets minimized after few seconds, upon dragging down a text displayed in the dialog. Before you do, we’d love your feedback”. This dialog had two buttons namely “Switch to Yahoo! Mail Classic” and “Cancel”. Clicked on the “Switch to Yahoo! Mail Classic”. Later for few seconds (around 3 to 4), the dialog remained as it is with no buttons. Clicked on the hyperlinked word ‘feedback’ and dragged it down to the taskbar, keeping the left mouse button without released. The new Yahoo! 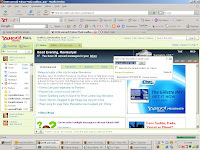 Mail version displayed changed to the Classic Yahoo! Mail version without any issue. As expected, the Yahoo! Mail was changed Classic Yahoo! Mail version. Now, started the hide and seek play. Opening any window that was opened or any new window would get minimized after 5 to 6 seconds upon opening it. This happened to all the window/GUI that remained maximized on the desktop. Using ALT+Tab, to get the minimized window to desktop, it did not work i.e., no window got restored back. “You cannot drag an item onto a button on the taskbar. However, if you do this without releasing the mouse button, the window will open and you can then drag the item into the window”, was displayed. Have a happy memorable Testing ! All were noticed only on Mozilla Firefox browser of version 2.0.0.9 as well as 2.0.0.14 only.All the above said were not noticed with Internet Explorer browser of version 6 as well as 7.